Although water lily is usually grown for its beautiful blossoms, it is also a plant with valuable medicinal uses. Read on to learn about water lily's uses, history, and more. Water lily may be best known as the subject of Claude Monet's famous series of paintings, but this flower is much more than just an ornamental addition to a water garden. Water lily has been used throughout history for its medicinal properties, and recent research has just begun to investigate the true value of the water lily. Controlling blood sugar and insulin levels. Water lily extracts have been shown to keep the levels of insulin in the body stable, preventing blood sugar fluctuations. Protecting against liver damage. Water lily has been observed to prevent potential liver damage, even helping the liver to heal. Water lily is also thought to be as effective as hydrocortisone at relieving pain caused by swelling. One of water lily's most important compounds is called nymphayol, and it works to keep insulin levels in the blood steady. This helps to prevent both hyperglycemia and hypoglycemia (too much and too little sugar in blood), which can keep energy levels steadier and prevent other symptoms of fluctuating blood sugar. The compounds responsible for water lily's other health benefits have not yet been identified, but researchers are studying the effects of chemical substances found in the plant, such as alkaloids, polysaccharides, glycosides, steroids, flavonoids, tannins, and phenolic compounds. Other herbs with hepatoprotective properties are chicory and dandelion, whereas yacon and burdock have similar hypoglycemic effects. Because not many studies have been done on water lily, it is unknown whether the plant has many side effects. Historical documents claim that it has potential effects on the central nervous system (CNS), including hallucinogenic and narcotic effects, but this has not been corroborated by research. Modern research has not indicated any medical interactions, but based on historical record, water lily supplements should not be used by those who are taking pain relievers - such as opioids - antidepressants, antipsychotics, or medications used to treat dementia, Alzheimer's disease, or Parkinson's disease. The plant should also be avoided by those with disorders relating to the central nervous system, including seizure disorders and psychological disorders. Additionally, because of the lack of research about the plant, those who are pregnant or breastfeeding should not take water lily. Water lily is not often thought of as an edible plant, but it can be consumed both in culinary and medicinal preparations. Raw. The roots, leaves, and unopened buds of water lily are all edible, although they are not commonly eaten alone or used as ingredients in other dishes. However, water lily can be used in stir-fry recipes and soups. Powder. Water lily powder is often taken by being mixed into a drink or other food, and it is most useful for regulating blood sugar and protecting the liver. Infusion. 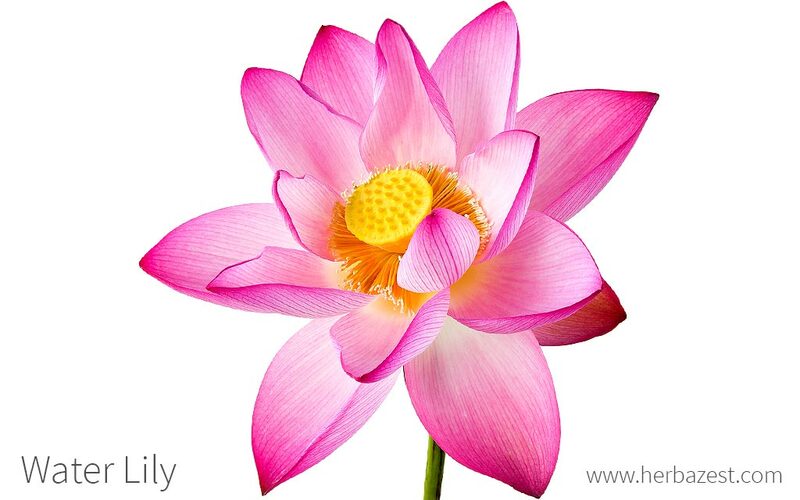 An infusion made from water lily is beneficial for stabilizing blood sugar and protecting the liver. This can be made by boiling one ounce (30 g) of powdered root in 10 ounces (300 mL) of water for 30 minutes, and is usually taken three times per day. Tincture. Take up to 10 drops of tincture a day to normalize insulin levels or to prevent liver damage. Extract. Up to one teaspoon of water lily extract can be taken internally to regulate blood sugar, or it can be applied externally to help reduce pain and swelling. Ointment. Applied externally, ointment made from water lily can relieve inflammation and pain. Water lily is popular among gardeners, so seeds or cuttings are often available at gardening centers worldwide. Depending on the location and climate, some stores may have only hardy or only tropical varieties available. Other natural forms of water lily for medicinal consumption, such as the powdered bulbs, are more likely to be found online. Medicinal preparations of water lily are not always easily found, but they may be available in certain herbal shops or specialized health stores, as well as through online retailers. Water lily is a popular plant for those looking to start a water garden. Growing water lilies can require a little extra care because they are grown in water instead of on land, but their beautiful blooms are worth the extra effort. Water lilies can be propagated either by seeds or by cuttings, generally rhizomes. To plant in a pond, the water lily seeds or rhizomes should be placed in a 10 - 16 inch (25 - 40 cm) pot. Do not cover the top of the rhizome with soil. The pot should be set in a pond with a water depth of 6 - 12 inches (15 - 30 cm). Water lilies should be planted in a heavy garden soil, such as clay or loamy soil. Add a layer of rocks or sand on top to help keep the soil in place. A place with full sun to partial shade is ideal for water lilies. Hardy water lilies should be planted in early spring, when the water temperature is approximately 50°F (10°C), whereas tropical water lilies should be planted later, once the water reaches 70°F (21°C). Both hardy and tropical lilies will bloom from late spring to early fall. Hardy water lilies can survive the winter outdoors in deep enough water by becoming dormant. If the water is shallow, they should be brought inside stored in a cool, moist environment below 50°F (10°C). Tropical water lilies cannot survive winters in cold climates, so should be brought indoors and kept in water at a temperature of 68°F (20°C). Fertilizer tablets may be used up to once a month in spring and early summer, but it is not advised to over-fertilize, as this will increase amounts of algae in the water. Although few pests are attracted to water lilies, the plants may be damaged by aphids, midges, and moths. Some water lilies are susceptible to fungus, but resistant varieties are widely available. Water lily is a perennial aquatic flowering plant. Some varieties of water lily can grow up to 12 feet (3.6 m) across, but most only reach about six feet (1.8 m). The plant's roots anchor it in the pond's soil, and stems connect the roots to the leaves and flowers that float on the surface. Blooms can be a variety of colors depending on the type of flower, but the flowers are usually reds, pinks, or purples. Many water lily blooms open in the morning and close at night, although some varieties will open at night and close in the morning. Water lilies all fall under the genus Nymphaea, in the family Nymphaeaceae. This family is made up of over 70 species, and over 30 of those species are types of water lily. All other plants in the family are also aquatic flowers. There are several different species of water lily. One of the most common is the white water lily, N. alba. This one is also commonly used in medicinal preparations, as is the fragrant water lily, N. odorata. Water lilies are commonly confused with lotuses because several plants within Nymphaea are colloquially referred to as lotuses. However, true lotuses actually belong to the Nelumbonaceae family, while all water lilies are under the Nymphaea genus, which belongs to the Nymphaeaceae family. Water lilies are thought to be some of the oldest aquatic plants alive. They were often used in art in ancient Egypt, and were known to the ancient Greeks as well. In fact, the water lily's genus - Nymphaea - was named after a water nymph from Greek mythology. They became popular components of European water gardens and are most famously represented in Claude Monet's paintings. Although the water lily is a common garden plant, it is not an economically-important crop, so little economic data about the plant exists. Aside from seeds and cuttings sold in garden centers, the plant is most commonly used as an ingredient in cosmetics. In ancient Egypt, water lily was considered sacred. Its blooms, which opened in the morning and closed at night, were associated with the rising and setting of the sun as well as the life cycle of death and rebirth. For this reason, it was used in funeral ceremonies. Gardening. The most popular use for water lily is as an ornamental in garden ponds. Skin care. Water lilies are occasionally used in cosmetics, as they can reduce redness and swelling in the skin and are thought to contain beneficial vitamins. Water lily is both a beautiful and useful plant to grow in any garden. Its ability to control insulin, protect the liver, and reduce swelling make it a valuable herbal remedy.